This is Poppy, Charlotte and Freya's dog. They've gone off for the day and it wouldn't have been easy for them to have Popy with them. She and I have had a lovely time together, we went for a long walk where there was a LOT of water. Poppy is a true labrador and loves water. @beryl Thanks Beryl. I was trudging through the water in my wellies while Poppy charged backwards and forwards having a great time. There was a lot of flooding. isn't she just lovely. yes. wet everywhere still underfoot . be nice have some warm dry weather! She is beautiful and your action shot is just great! Both enjoying the fun, lovely having a dog to take on a walk! Poppy is enjoying herself! always great to borrow a dog! She is having lots of fun. That's a great action photo! Dogs have so much fun in water. what a great action shot....did you follow him in to the water. ha-ha. 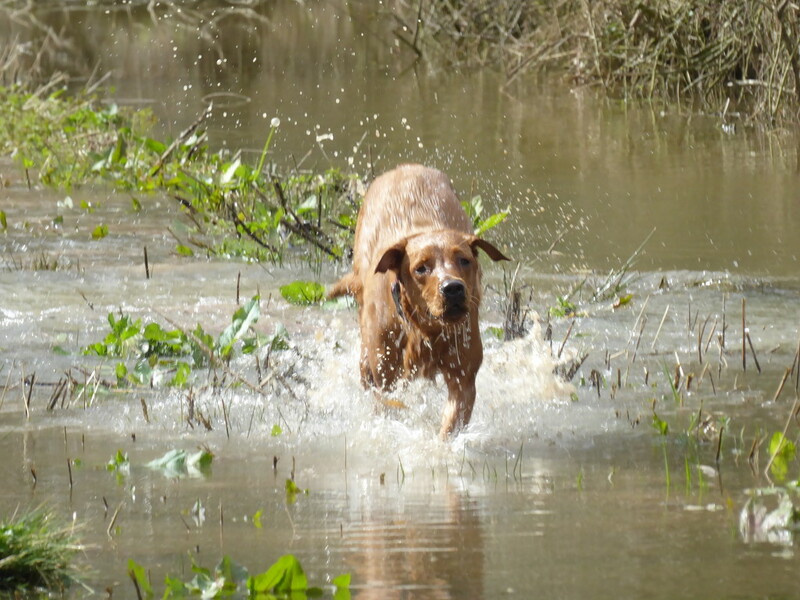 Great action shot...... Labs love the water don't they ! She's certainly enjoying herself. Great action photo.